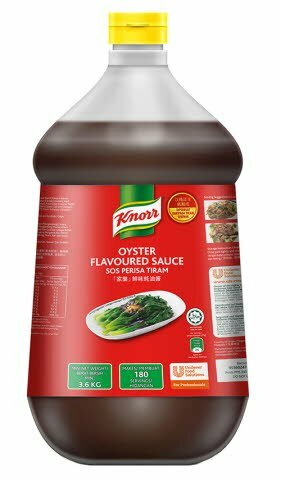 Knorr Oyster Flavoured Sauce is a popular seasoning for local dishes. It is used extensively in frying and braising recipes. Also suitable as a gravy for seasoning. Sugar, Salt, Modified Food Starch, Flavour Enhancer (Monosodium Glutamate), Wheat Flour (Contains Gluten), Yeast Extract, Oyster Extract (Contains Oyster), Food Colour (Caramel Paste), Food Acid (Lactic Acid), Flavors (Contains Oyster and Fish and Soybean), Preservative (Sodium Benzoate) (E211), Flavour Enhancer (Disodium Inosinate And Disodium Guanylate). All food additives are of plant, animal and synthetic origin. May contain traces of sesame.